Our buildings require one thing over everything else, and that is a good, solid and most importantly, level base. This can be well laid paving slabs, a full slab of concrete, or a wide variety of other solutions depending on your particular circumstances. It is possibly the most important part of the process and shouldn't be underestimated. Because of the nature of all log cabins, they rely on a completely flat and level base for them to work correctly. The buildings are not 'fixed' together in a regular sense and so the stability of the base is paramount. 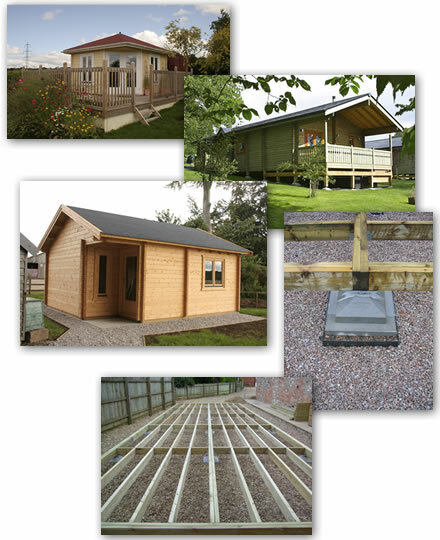 At Forest Products we have very good relationships with many builders and landscapers, in various areas around Scotland, to help you obtain the best solution for your particular needs. That could mean slabs or concrete but it could also be wooden frames suspended on stilts, concrete adjustable feet, block walls etc. It all depends on what your ground is like, whether your on a slope, if it is particularly wet ground or any number of other situations. Most companies selling log cabins tend to use wooden or plastic posts with a wooden frame attached as a base. This can be suitable but it is quite often not the best solution. At Forest Products we have over 20 years experience in supplying the best options available and we would be happy to discuss the various options with you. We can provide you with a fixed quote for any work involved and you will have the knowledge that the base has been done to the exact specification that best suits the building.